Peekaboo Barn / ¿Quién está en el granero? 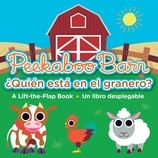 Fans of the toddler app Peekaboo Barn will welcome the tactile feel of this sturdy board book with lots of flaps to lift. And for those who’ve never seen or played the app, the barn setting, adorable animals, and sound words make this a book for the very young that stands on its own. 20 / 7" x 7"